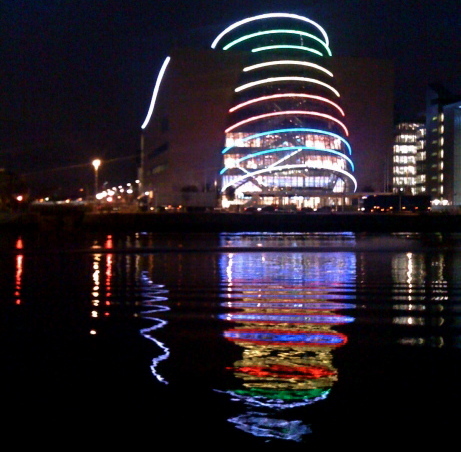 On the final day of the Interaction’12 conference, my colleague and I arrived at the Dublin Convention Centre late – having skipped the morning sessions in favour of some personal decompression, err sleep, time. As we made our way up the escalator to the conference area, the only other person in sight was a gentleman (1) on the stair in front of us. Bedecked in suit and tie with a dazzlingly rich pink shirt, an ensemble somewhat out of place among the casual attire of the majority of conference attendees, he turned around to ask if we would like to play a story game as he reached out with an open envelope inviting each of us to select one piece of paper. On each piece of paper we would find a single word. He explained that there were five words in total, he named them (I’ve forgotten the list, sorry) and asked us to take about 30 seconds to think of a story we could tell that evoked the word we had selected, but to not give the word away. Based on the story we would tell, he would guess which of the five words we had selected. The prospect of this impromptu story telling was both playful and frightening, and we weren’t going to get out of it! So we dove in. For lack of any handier immediate reference, my story was a simple simile likening the illuminating sessions I’d attended over the last couple days with how a performer might draw a long cloth from his sleeve – a stream of surprise and delight. MAGIC, he said before I’d finished my last sentence. Yep. He then turned to my colleague who told a story of how she and a friend, in their youth, had first learned to paddle a canoe a distance across a lake. They didn’t think they would make it but they did in the end and felt really proud of themselves. TRIUMPH, he said, as we delighted together in the wonder of the moment and the power of simple imagery. I loved this workshop. It was fun from the start. It kept us engaged with a mix of presentation and sketching exercises throughout, and we left with skills we didn’t know we had that we could immediately put into practice. So what are sketchnotes? In short, they are visual notes. Instead of relying purely on textual transcriptions of a talk – but still using text as an accompaniment – an evolving set of personal visual mnemonics are used to document what you hear and see in order to capture a meaningful, and way more fun, reference for yourself and others. 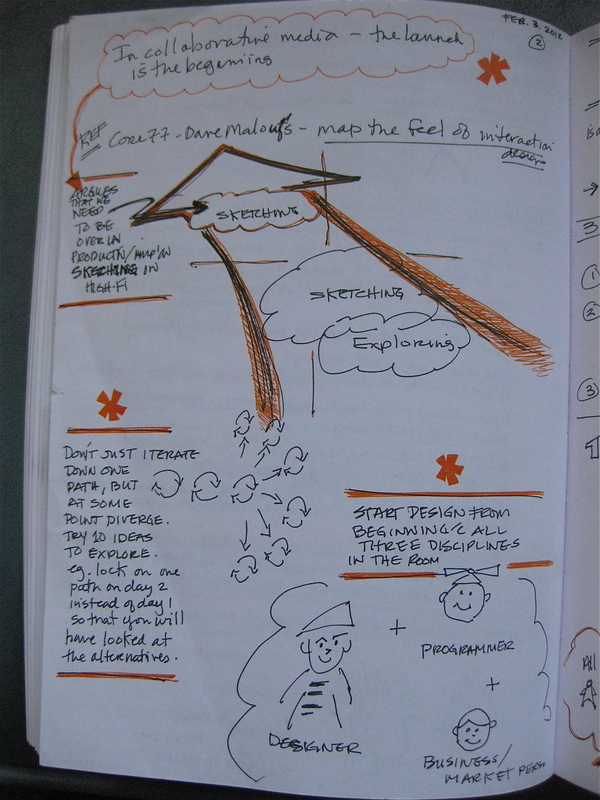 As explained in the workshop, sketchnotes help us understand, explain, create and remember. Their value is their non-linearity; the freedom to play with visual hierarchy by employing different techniques such as typographic weight, colour, visual hooks and line weight; the personal visual mnemonics you can develop for yourself over time; the real-time processing they require in order to translate message to image, which takes more concentration and so you learn more; and they’re fun to create and to share! Sketchnotes are not about being a good artist but about being a good thinker. Exercise from the workshop where we had to sketchnote Gever Tulley's TED Talk "5 dangerous things you should let your kids do"
Sketchnotes from Jonas Lowgren's keynote "Exploring, Sketching and Other Designerly Ways of Working"
Sketchnotes from Amber Case's keynote "From Solid to Liquid to Air: Interaction Design and the Future of the Interface"
While not the presentation from the workshop, Eva-Lotta Lamm has a rich presentation on this topic on Slideshare. Another of my favoured sessions on the agenda was a presentation by Dirk Knemeyer on the importance of understanding ourselves. He took us on a journey from how technology was once perceived as magic, to the mystery of ourselves, to the application of sciences of human understanding to interaction design. On mystery: It was in this chapter that I found the magic. Dirk asked us each to turn to one of our neighbors and to share the most meaningful moment in our life. He then asked us to share the most awful moment in our life. He then asked us to raise our hand if the most meaningful moment had to do with ourselves and another person. Most of us raised our hand. He then asked us to raise our hand if the most awful moment had to do with ourselves and another person. Again, the majority of us raised our hand. He then summed it up by saying that the most meaningful moments in life are about self and other. The most awful moments in life are about self and other. Yet, we don’t know ourselves, or we don’t take what we know about ourselves and use it to our betterment. On application: Because as interaction designers we are mitigating interactions between people and things, we need to make being a user expert core to our professional identity. We need to understand ourselves by developing at least a surface knowledge of the sciences of human understanding: psychology, sociology, neuroscience, endocrinology, and economics; and in-depth knowledge in at least one of these sciences, because important design to come will be for who we are (e.g., the introvert or the extrovert). It will not be for demographics but for individual needs. Dirk presented the “Facio” framework for understanding the individual in different dimensions (analytical, physical and emotional) – a tool used to design for the five levels of human needs and emotions: participation, engagement, productivity, happiness and well-being that was conceived by Involution Studios (a design company founded by Dirk Kneymeyer and Andrei Herasimchuk in 2004). You can see Dirk Knemeyer’s presentation from the conference on Slideshare. Easily the magic here was Angel’s delivery. She really rocked it with her confidence, enthusiasm and warmth. What better combination for someone talking about sharing. Early on, Angel posed the question “Why do we share?” and explained that getting to the root of this is crucial for user experience designers because we are judged on how much people share within the systems we design. She then took us on a historical journey to understand that sharing evolved from our relationships, specifically those of dominance (sharing as part identification with the tribe and for survival), communality (sharing because we get that warm and fuzzy feeling when we do) and reciprocity (sharing for mutual benefit and rewards). Bragging, e.g., “I’m having a pint at a pub in Dublin!”, which can be okay because it is part of our desire to form relationships, it can be interesting or useful to others, and it can help us make connections. It’s not all narcissism. Complaining, which is a basis for quick and easy relationships, and can be only commiserative or it can be constructive. Reaching out, which is about showing we care, i.e., sharing = caring. To learn more about these characteristics and see more details on what I shared above, see Angel Anderson’s presentation on Slideshare. The Disruptive Age: Thriving in an Era of Constant Change, keynote presentation by Luke Williams. See related overview from Johnny Holland, under Interaction 12: Day One. 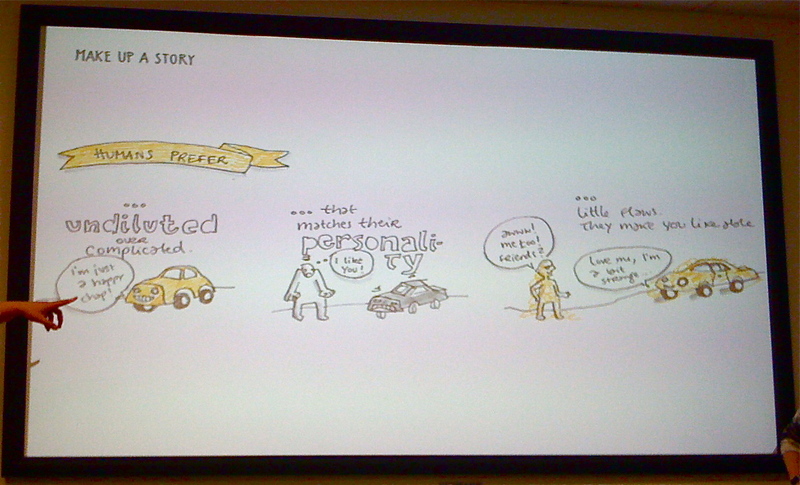 Exploring, Sketching and Other Designerly Ways of Working, keynote presentation by Jonas Lowgren. See related article Designerly Ways of Working in UX, by Jonas Lowgren, published on October 27, 2011; and related overview from Johnny Holland, under Interaction 12: Day Two. Why is no one using your product?, 10-minute presentation by Julie Baher. 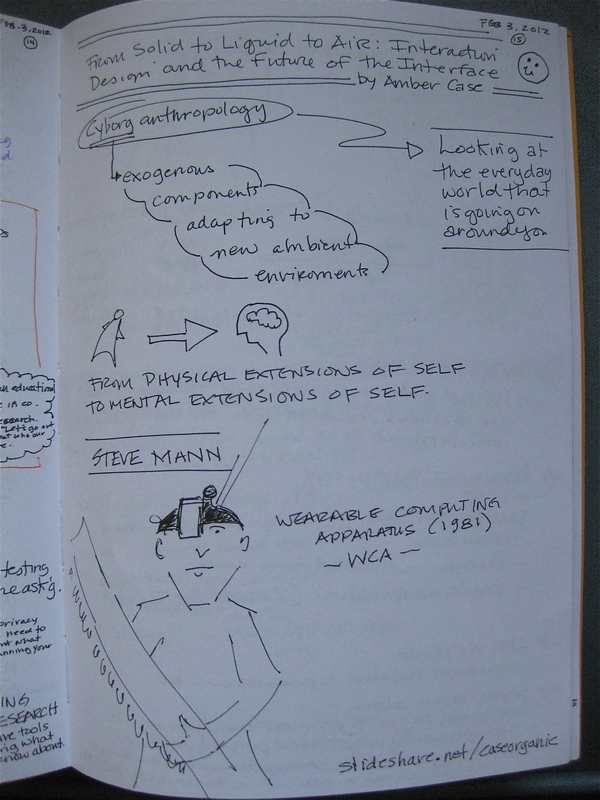 See related overview from Johnny Holland, under Interaction 12: Day Two. From Solid to Liquid to Air: Interaction Design and the Future of the Interface, keynote presentation by Amber Case. See related overview from Johnny Holland, under Interaction 12: Day Two. 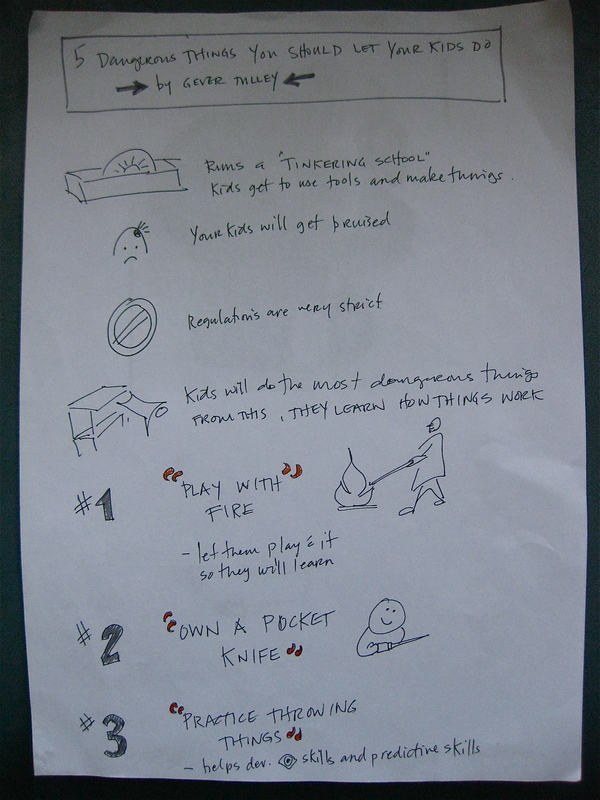 Ritual in Interaction Design, 10-minute presentation by Matt Nish-Lapidus. See related overview from Johnny Holland, under Interaction 12: Day Three. Rage Against the Machine? Designing our futures with computing, keynote by Genevieve Bell. See related overview from Johnny Holland, under Interaction 12: Day Three. Hack to the Future, keynote presentation by Fabian Hemmert. See related overview from Johnny Holland, under Interaction 12: Day Three. How to lie with design thinking, 10-minute presentation by Dan Saffer. See related overview from Johnny Holland, under Interaction 12: Day Three. It serves me right for sleeping in.